We welcome players of all experience levels. Whether you’ve never skated before, or have been playing hockey since before you could walk, the club is a great opportunity to further develop your skills and have some fun in a team environment. The team offers two skills clinics a year open to anyone who is looking to improve their skills. Our head coach will be leading the sessions. Pre-registration is encouraged. These are the main basic rules but by no means all of them. At the end is a list and description of some important terminology. The rule is that the puck must enter the offensive zone before ANY of the offensive players do. If the puck does go in the offensive while an offensive person(s) is in the zone then all offensive players must "tag up" and leave the zone before any of the offensive players enter the zone again (aka everybody gets out of the zone then the puck can go in followed by the offensive players). Here's a link to the NHL rule which explains it in great detail. Automatic or no-touch icing: as soon as the puck crosses the second red line (goal line) play is stopped. Hybrid icing: play is stopped immediately if the player on the opposing (defensive) team reaches the faceoff dot first, instead of skating all the way across the goal line to touch the puck. This type of icing is intended to reduce the number of collisions along the boards during "touch icing", but still allowing the team that iced the puck to get to it first to wave off the icing. Otherwise icing is waved off. Touch icing (NHL): a player on the opposing (defensive) team other than the goalie must touch the puck to stop play for icing. Otherwise icing is waved off. Icing can also be waved off for other reasons: the team who iced the puck is shorthanded, the referee thinks the opposing team could have played the puck before it crosses the goal line, or if the puck goes in the net (so goalies always be ready). Checking: In women's hockey there is no checking (aka no hitting) but body contact is allow. Fighting: It is assessed when players drop their gloves and throw punches at each other. In our league fighting is not tolerated. The area on the ice in front of the goalie. It stretches diagonaly towards the boards from each end of the goal posts. See picture on the right. This is the prime scoring area known as the "slot". This is the best place to be in the offensive zone and greatest opportunity to score for the shooter. Any time you get the puck, defensive players will be on you. A "quick release" is best to get the shot off and catch the goalie out of position (aka wrist shot or snap shot). If you're on defense, don't leave the opposition alone. This is when the oponent gains possession of the puck in the offensive zone and the offensize zone team trys to get the puck back before it leaves the zone. Forechecking can also be done in the neutral zone. If you are forchecking, you are trying to get the puck away from the other team who is trying to break out of their zone. There are many forechecking systems and each team will have a different system. Some of them are single forecheck, double forecheck, left or right wing lock, and many more. This is when a player must skate back towards their goalie and cover an opponent while trying to get the puck back. Usually done by forwards as the defense players are aleady skating backwards in position. Backchecking is very important because if it's not done then you can give the other team a player advantage and a good scoring opportunity. Goalie: Perhaps the toughest position, the goalie is the one player who can control a team’s confidence. Her job is to keep the puck out of the net. Defensemen: A team at full strength has two — one on the left side and another on the right. Nowadays, there are three primary kinds of defensemen. One is creative and offensive-minded; she likes to handle the puck and lead the team up ice, but is not too physical. Another is defensive-minded, a stay-at-home bruiser who plays a physical game and doesn’t often venture out of her zone with the puck. And there are those rare athletes who are a combination of the two. Right wing: She works the right side of the ice for the most part but is not limited to the right side in the offensive zone. She needs to be a physical player who is good along the boards and in the corner. She is responsible for the opposition’s left defenseman in the defensive zone. Left wing: Traditionally a left-handed shot, but right-handers can play this position too. A right-hander has a better angle to shoot from when she’s coming in on her wing. Like the right wing, she needs to be able to dig out the puck from the corners and battle in front of the net. Center: She quarterbacks the team at both ends of the ice. Must be good at face-offs and passing, and it doesn’t hurt if she's a good shot as well. Coaches want a lot of creativity in this position — and a lot of hockey smarts. Hockey has three periods. Our league has usually 11 minute periods with a 1 minute rest period in between. The side our bench is on is going to be our defensive zone for the first period and third periods. For the second period, the direction of play reverses and our defensive zone is on the opposite side of our bench, which will make it harder and longer for players to change shifts especially on the fly. Hockey is fast paced and players stay on the ice for about 30 seconds at a time (a shift) before switching (in our league it's more like 1 minute shifts). There are two ways to change shifts either during a whistle (play is stopped and there's a face-off) or on the fly. To change on the fly, the player comes to the bench (typically one player at a time or the other team will have a big advantage) and shouts out their position so that the player who needs to come on next gets ready. The player coming in jumps over the boards as the player going out does the same (can use the doors but it's better not to). This doesn't have to happen exactly at the same time but about at the same time. It is best to change on the fly when the puck has been dumped into the offensive zone or while we are in the offensive zone. Avoid changing on the fly when in our defensive zone and during backchecking. Changing before you get dead tired is also key for the team and key for keeping up your energy for the whole game. This is generally where you'd line up for face-offs (green=defense, red=offense). However, each team may have different face-up plays where the line up position and each persons role may differ. To score, we need to keep the puck out of our zone (the defensive zone) and into the other team's zone (the offensive zone). 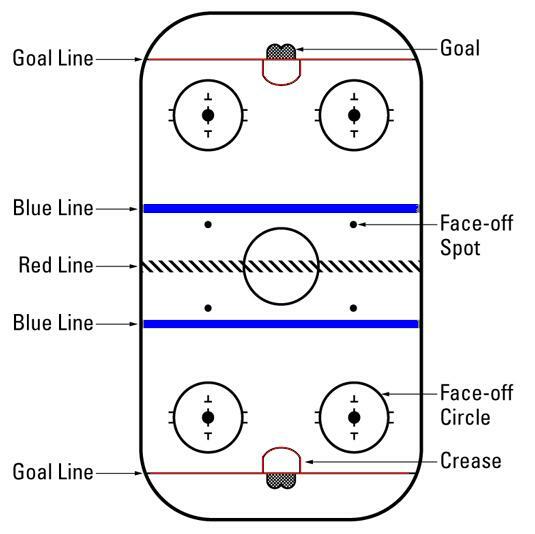 In the defensize zone the main goal is to get the puck out (across the blue line into the neutral zone) if we have control of the puck, and if we don't have the puck the goal is to not let the other team score. Teams can play man-on-man coverage (use this for pick-up or intramural hockey) where each player is responsible for defending another player or a team may have some kind of a zone coverage set up where players are responsible for defense in particular areas of the ice. Each team may run a different breakout system that will vary but the main goal is to get the puck out of the zone while maintaining control of the puck. Here's some general breakout reading. Now that we've stolen the puck and broke out of our zone we are in the neutral zone (between the blue lines). From the neutral zone we proceed with the puck into the offensive zone so we can score. This is where hockey creativity is good. The basics are that there are two defense at the top of the zone, one in the middle of the ice and one by the boards on the side of the ice with the puck. These two move back and forth depending on where the puck is and their job is to keep it in the zone and be open for a pass from the forwards. The forwards need to be creative and keep moving at all times to make it hard for the other team to defend you; on this end of the ice it doesn't matter if you're left wing, right wing, or center, you'll be moving around everywhere. The best is to have the three forwards in the formation of a triangle so that there are multiple passing options. No one in the triangle should be even with another forward either across the width or the length of the ice. Usually one person is in front of the net, one person along the goaline and one person near the boards up towards the tops of the circles. Each team will practice things to do from the offensive triangle positions: things like give and go or cycling. The hope is to create a lane or mini 2-on-1 opportunity to get a good shot off from somewhere in the slot. The person who committed the penalty is in the box so that team is down a person and only gets four skaters; the other team still has five skaters. The team with five skaters is on a power play; the other team is on a penalty kill. Usually you'd be in your defensize zone since you're down a player, in that case the simplest defense is called the box and you defend the slot (area in front of the net) by staying in a box formation. Another penalty kill formation is the diamond. If you get control of the puck you'll want to ice the puck because when you're down a player icing does NOT apply. When the puck is in our offensive zone you'll only want one person to go into the zone and the others to hang back. If we have the puck that one person is basically on their own to keep control of it and not let the other team have it. If we don't have the puck, we are trying to pressure the other team into giving us the puck or being able to steal it back, this is called a forecheck. When on the power play one should be able to keep control of the puck and stay in the offensive zone since that team has an extra person. If the power play team doesn't have control of the puck they need to have TWO people going after the puck since we've got an extra person and can afford to have two people converge on the puck. 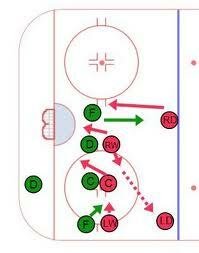 In the defensive zone, each team will have special breakouts specifically for the power play. Once in the offensize zone, each team will have specific plays to run to create scoring opportunities.